Our first e-newsletter in Spring 2008 highlighted Aurora’s accomplishments during its first 10 years. Five years later, this article reflects on what we have achieved and what we still need to do. Enhancing RWIS component and system accuracy, reliability, and compatibility. Integrating systems, equipment, and data. Overcoming institutional barriers to widespread implementation of RWIS. In the five years since 2008, Aurora has continued to improve RWIS efficiency and its reach through projects like the development of computer-based training, mobile sensing, and integration of RWIS with maintenance decision support systems (MDSS). Today, Aurora-supported RWIS innovations are making real differences: Roadway maintenance departments across the country and in member countries are working more efficiently and effectively. Streets and highways are safer. Individuals and organizations have better weather- and travel-related information, sooner. Bad weather is having fewer negative impacts on traveling, shipping, and other transportation-related aspects of our individual and related economies. Leland “Lee” Smithson, coordinator of AASHTO’s Snow and Ice Pooled Fund Cooperative Program (SICOP), says the need for enhanced, automated, data-driven systems for guiding decision making will only increase in the future. He sees two arenas in particular in which Aurora can make major contributions. First, roadway agencies are facing major losses of organizational knowledge due to retirement of “baby boomer” personnel. Smithson encourages Aurora members to focus on projects that support good decision making by new and inexperienced staff. “Algorithms that can quickly manipulate data and make accurate predictions,” he says, “can help replace some of the skills and experience we are losing.” Decision Support Systems that can be queried with “what if options” can assist the decision maker in optimizing operational strategy while simultaneously building an experience background. Second, Smithson encourages Aurora to focus on projects that help realize the broad vision of MAP-21 (Moving Ahead for Progress in the 21st Century Act, Fall 2012). MAP-21 is this country’s first long-term highway authorization since 2005. It shifts the transportation community to performance-based investments that accomplish measurable target outcomes in areas such as safety, environmental sustainability, economic vitality, and others. Enhance decision-making based on more and broader data. Broaden and enhance communications with the public. Experience collective efficiencies and capabilities. Installed, as part of a system-wide upgrade of RWIS stations traffic counting and classification technologies at two stations. Weather, roadway, and traffic data collection technologies share the same physical home, power source, communications system, and maintenance resources. Added zoom cameras with infrared illuminators to several stations to enhance road condition information collected at the stations. The information is integrated with traffic data and provided to maintenance personnel and to the public. Integrated almost 100 percent of its RWIS and automated vehicle location (AVL) systems. Again, both systems experience the economies related to sharing key infrastructure. Added very sensitive sensors to RWIS stations at load-sensitive roadway sites to measure ground temperatures at several levels below the surface. The data affect year-round load restrictions as well as spring load adjustments (SLA). Coordinated with the Enterprise system on Ontario’s Highway 21. “Mother” [Chris what does that mean?] RWIS components are being used in an automated early-warning system for poor visibility. Such a system has the potential to reduce Ontario’s reliance on (and the costs of) observations by provincial patrol officers. Installed Fixed Anti-icing Spray Technology (FAST) systems (including one mini-FAST system) at eight RWIS stations, where local road-weather information data automate FAST operations for the adjacent roadway. Added devices that detect and measure freezing rain to RWIS stations. This technology is still in the demonstration phase. Used data from rain gauges installed at RWIS stations to better understand the effects of climate change. This information can affect diverse activities, including revisions to culvert designs to accommodate rain events that are becoming rarer but more sudden and intense. Integrated roadside “road condition” signage with nearby RWIS stations. In the past, messages on the signage were updated based on call-in information. Now messages are automatically updated based on current RWIS data. In addition, Ontario’s RWIS data transmissions system-wide have been switched from telephone lines/poles to wireless internet-based systems. Internet systems are smarter. They are also less susceptible to weather-related damage and are remotely rebootable, reducing “windshield time” for station maintenance personnel. The cost savings from this conversion alone have allowed Ontario to add 26 more stations. Other Aurora members have similarly exciting advancements in the works. Collectively, we can continue to make a difference during the next five years. Aurora is excited to welcome its newest member. 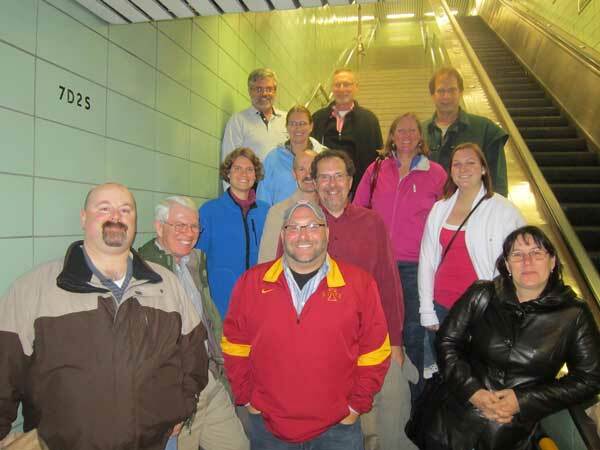 The Kansas Department of Transportation (KDOT) joined Aurora at the October 2012 board meeting in Toronto. Ron Hall is KDOT’s representative on the board. Welcome, Ron! Outside the meeting room, our hosts treated the board to tours of Toronto’s Transportation Management Center and of the Canadian weather network/channel. 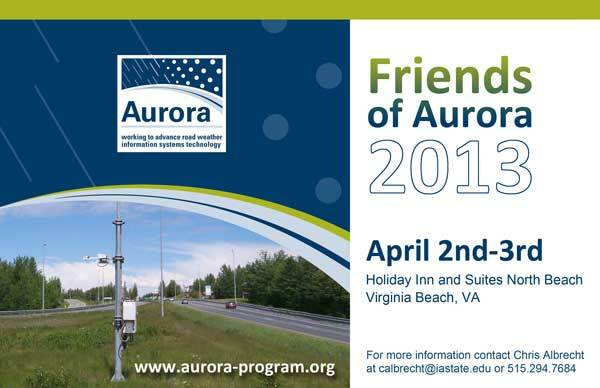 Aurora will host the 2013 Friends of Aurora event April 2–3, 2013, in Virginia Beach, Virginia, in conjunction with its board meeting. Friends of Aurora is an outreach initiative with private RWIS concerns to create a dialogue between public and private road weather communities. An evening reception on April 2 will allow vendors and other guests to meet informally with board members. On the morning of April 3, Aurora board members will present information about completed and ongoing research projects and priorities, and vendors will present information about their products and priorities. For more information about the Friends of Aurora event, contact calbrech@iastate.edu at 515-294-7684. Climatic trends: Pavement temperature forecasts from the maritime climate group had the highest quality, and those from the mixed climate group had the lowest quality, both in terms of mean absolute errors (MAEs) and percent of acceptable forecasts (PAFs). The significant performance differences between the regions suggested that the RWIS forecasting performance may be affected by climatic trends; that is, the unique climatic patterns of the regions may have caused the differences in RWIS forecasting performance. Locational attributes (e.g., correlation between the forecasting accuracy of RWIS stations and topographical features, such as altitude and amount of vegetation cover, and geographical features, such as distance to local lakes/waters). The forecasting performance RWIS stations in the maritime climate region near coastal areas had a negative correlation with the distance from a nearby large water body. On the other hand, no significant correlation was found in either the mixed or continental climate groups. Seasonal variations. Forecast errors exhibited seasonal variations, with forecasts for the shoulder months (October and April) tending to be poorer than other months. Diurnal trends. Daytime forecasts were less accurate than those generated for nighttime. Forecast length. As expected, the accuracy of forecasts deteriorated quickly as the forecasting horizon increased. There was a clear quantitative relationship between forecast errors and forecasting time and length, suggesting that it is possible to quantify these errors based on the time a forecast is made and the time the condition is to be forecasted (forecasting horizon). The primary goal of this project was to demonstrate the accuracy and utility of implementing a freezing drizzle detection algorithm in roadway environmental sensing systems (ESSs). The problems related to the occurrence of freezing precipitation range from simple traffic delays to major crashes that involve fatalities. Freezing drizzle can also lead to economic impacts from lost work hours, vehicular damage, and downed power lines. Although transportation agencies can perform preventive and reactive treatments to roadways, freezing drizzle can be difficult to forecast or even detect. Because weather radar and surface observation networks poorly observe these conditions, their detection requires special instrumentation and analysis. The Federal Aviation Administration’s (FAA) development of aircraft anti-icing and deicing technologies included creation of a freezing drizzle algorithm that utilizes air temperature data and a specialized sensor capable of detecting ice accretion. The Aurora project tested the freezing drizzle detection methods (developed for the FAA and the National Weather Service (NWS)) in a roadway environment, using a combination of icing detection equipment and available ESS sensors. The FAA algorithm was applied using data from standard roadway ESSs. The work performed in this study lays the foundation for addressing the possibility of using roadside freezing precipitation detection (e.g., icing detection) sensors to determine the occurrence of pavement icing during freezing precipitation events and the rates at which this occurs.